Details written by Elie Abou Tayeh. field ahead of you, you will notice 3 triangular shaped rocks. The middle big one is the Section IV. private land. The land owner has lots of veggies grown there so please be careful. Furthermore, the land owner doesn't like trespassers and the starting bolts may have been damaged intentionally. We would recommend accessing Section IV from this way: 1. Left from sector II along the dirt road. This will get you to the top of crag and then you would have to rap down to the ledge which is the starting point of all upper four routes. Alternatively, you could walk across the field behind the small hut and scramble up to the beginning of the lower routes. With this method, you have to multi-pitch to get to the upper routes. This sector is an excellent spot for beginner climbers. The slabs offer a good training for sports and traditional amateurs. The routes start where the red dot is on the picture below. The spot should be easy to find. They are all well protected and anchors are placed on top of each route. You require 5 to 6 quickdraws for each climb here. The difficulty is 4 at max. 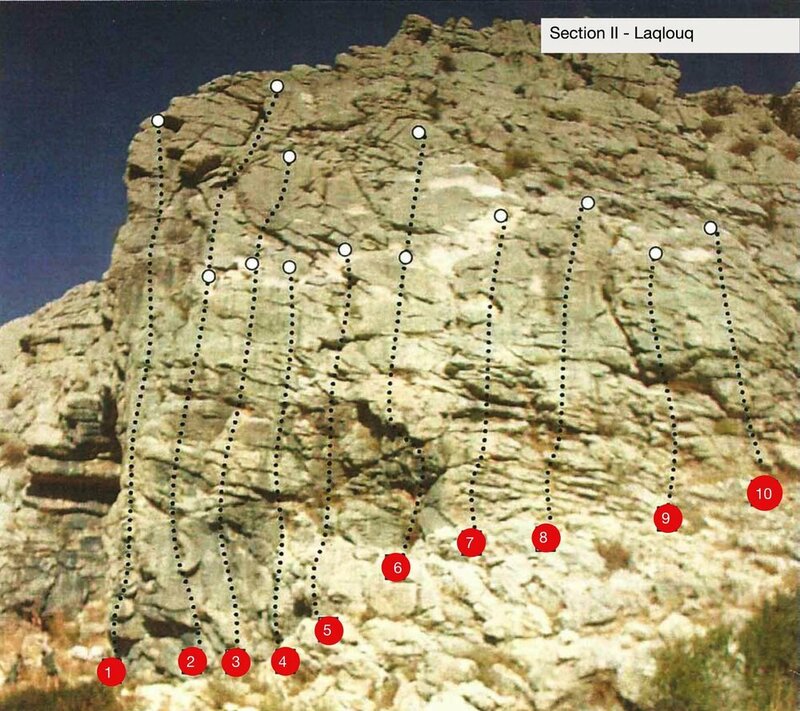 Sector 2 of Laqlouq climbing site offers some slightly challenging routes with potential for traditional climbing as well. The routes start on the right of a big cave. This sector can be climbed on sports or trad. The cracks offer heaps of places for placing protection. - From sector 2 along the dirt road. This will get you to the top of it and then you would have to rappel down to the ledge which is the starting point of all upper four routes. - Alternatively you could walk across the field behind the small hut and scramble up to the beginning of the lower routes. With method you have to multi pitch to get to the upper routes. They are graded 5 and require 6 to 7 quickdraws.